It just makes sense that walking the golf course will burn more calories and improve fitness more than riding in a cart, but did you know it might also improve your scores? According to a study conducted by Neil Wolkodoff, Ph.D., medical director for the Denver Center for Health and Sports Sciences in Colorado, that may be the case. He conducted a study using eight golfers strapped with sensors. During the study period, each person played the first nine holes of a championship course using each method for getting around the course. Not surprisingly, the golfers that walked and carried their bag burned the most calories and those that rode in a cart burned the least. However, when they tracked game results, all eight golfers followed the same pattern. They had their lowest scores on the days they walked and used a golf bag push cart for their golf bag, and the highest scores on the days the golfers carried their bags. So walking the course is a great idea on many levels, but it pays to be prepared if you want the best results. 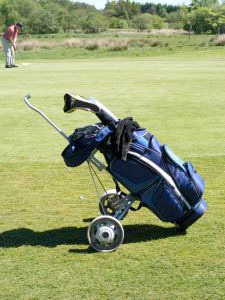 If you’re going to carry your bag, consider choosing a lightweight golf bag. Even a light bag will begin to feel heavy halfway around the course, so start as light as possible. Look for a bag with double straps, as they help to distribute the weight more evenly, helping you avoid back pain and strain. And remember to always lift with your legs. As already mentioned, push carts may well improve your score. But they will also help you avoid back fatigue. Three-wheeled carts are easy to push and are more maneuverable on the course. Aluminum frames are lightweight and most fold easily for transporting and storing. Like just about everything else these days, golf shoes come with dozens of choices. If you’re going to be walking the course, it is just as important for the shoe to feel like an athletic shoe as it is to have the proper grip on the bottom. Look for shoes with a flexible upper (whether leather golf shoes or man-made golf shoes), breathability to keep your feet feeling comfortable through 18 holes, and cushioning to absorb the impact of walking long distances. It will be hard to concentrate on your game with painful, blistered feet. As you make your selection, keep in mind that many clubhouses do not allow metal spikes indoors these days, so you may want to consider a shoe with softer spikes.